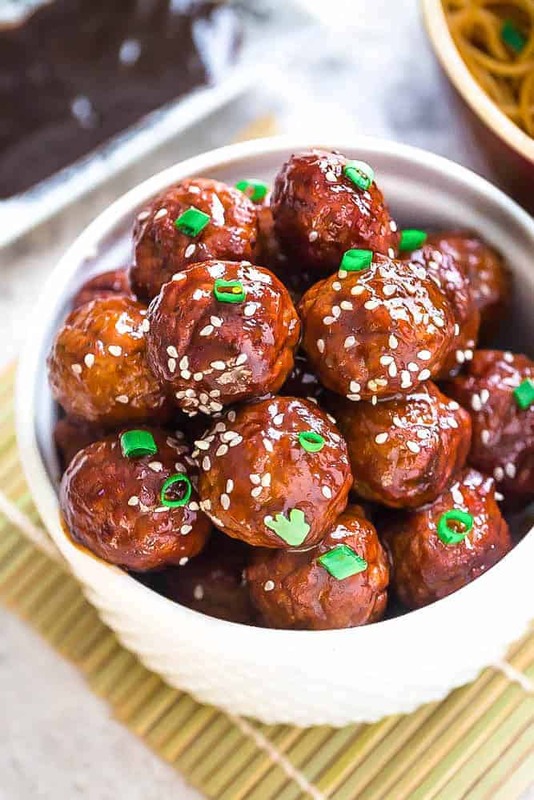 Asian Glazed Meatballs – moist and tender chicken meatballs are the perfect appetizers for game day or any Super Bowl parties. Best of all, coated in a sweet and sticky glaze and come together easily in the Instant Pot, Slow Cooker or oven. When it comes to easy appetizers, you can never go wrong with meatballs. They are always a crowd-pleaser and just perfect for holiday and football parties. I love that you can make them ahead and just cook them on the day of. And the best part is, they are easy to customize so you can swap out the sauce – or even make a few different ones depending on what you like or have on hand. 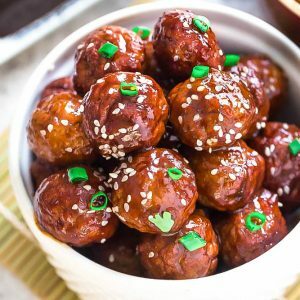 These Asian Glazed Meatballs are packed with flavor and would make a delicious addition to your Super Bowl line-up. They come together in under 30 minutes in your oven or Instant Pot or you can cook them low and slow using your crock-pot. Serve them as finger foods with toothpicks or in a big pretty bowl. Combine the panko, eggs, green onions, garlic, ginger, low sodium soy sauce (or GF tamari), sesame oil and salt and pepper. Once everything is mixed up, you’re going to mix in the ground turkey. This way, the flavors will distribute evenly without overworking the meat. You’ll get perfectly tender meatballs every single time. For the meat, you can also use beef, chicken or pork if that’s what you have on hand instead. Once the meat is mixed in, you divide the mixture into roughly 3 tablespoon-sized portions per ball. You’ll want to ensure they’re all uniform in size. That way, they’ll cook evenly without any of them getting tough. 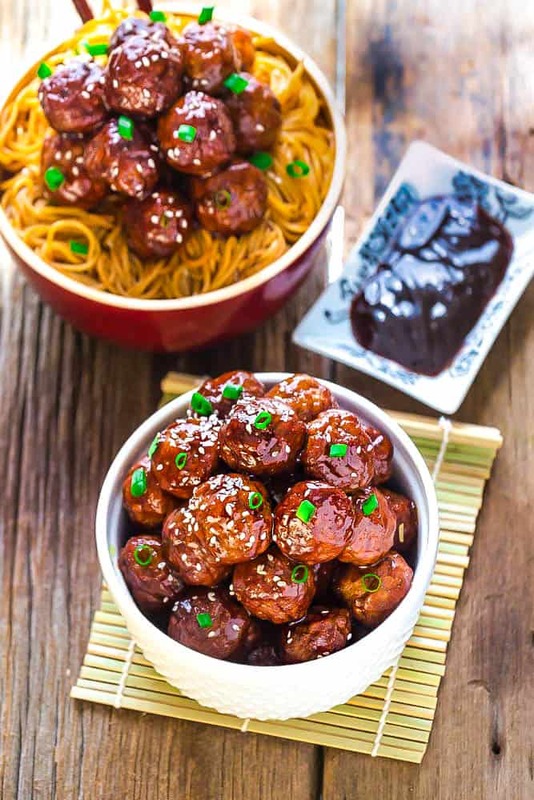 To make the glaze, simply combine Hoisin sauce, low-sodium soy sauce, Sriracha, rice vinegar, honey and some freshly grated ginger in a medium saucepan and bring to a boil for about 5 minutes, until reduced. 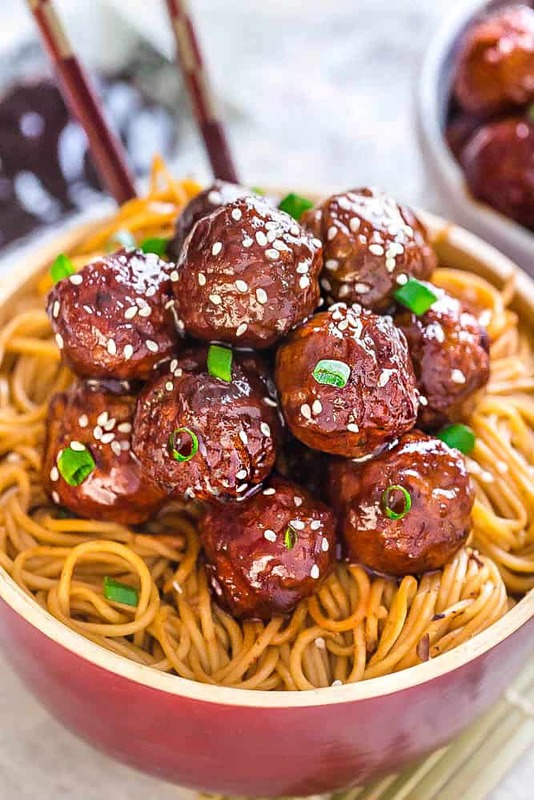 These Asian Glazed Meatballs cook up juicy, tender, and the sweet and spicy sauce gives them so much flavor. They’re perfect for parties, events, holidays, game days, tailgating, or serve them for dinner with a bowl of noodles or rice. In a large bowl, combine the eggs, panko crumbs, green onions (whites only), garlic, ginger, soy sauce, sesame oil, salt, and pepper. Add the ground turkey and mix thoroughly using clean hands. Do not overmix, it will result in drier meatballs. Form into round meatballs, about 3 tablespoons each. Combine all the ingredients for the glaze in a medium saucepan over medium heat. Bring to a boil and reduce heat allowing to simmer for about 3-4 minutes. Once the sauce has thickened, remove from heat. Place the meatballs, evenly spaced, on the prepared sheet pans. Brush the meatballs with a thin layer of glaze. Bake in preheated oven for 20 minutes. Brush with additional glaze and broil about 2 to 3 minutes. Transfer to a platter and brush on remaining glaze. Top with sesame seeds and reserved green onions. Add 2 tablespoons olive in the insert of the Instant Pot. Press SAUTE and brown the meatballs, about 2 minutes per side. (You may need to work in batches) When brown, press CANCEL and pour in half of the glaze. Cover with lid and turn valve to SEALING. Cook on MANUAL or PRESSURE COOK (HIGH) for 10 minutes. After 8 minutes, allow to release naturally for 5 minutes then quick release. Carefully open the lid and coat with half of the glaze. Preheat oven to 400 degrees. Line 2 large baking sheets with foil and lightly coat with cooking spray or oil. Place the meatballs, evenly spaced, on the prepared sheet pans. Transfer the meatballs to slow cooker along with half of the glaze. Cook on low for 2-3 hours. Mix 2-3 times to evenly coat with sauce. Brush with remainder of the sauce. Transfer the meatballs to a serving platter and brush with the remainder of the glaze. Top with sesame seeds and reserved green onions.